Finished Size: 1.5" x 1.5"
My usual habit is to try out a pattern-book shortly after buying it (or checking it out from the library, as was the case here). This ethnically appropriate interpretation of my personal zodiac sign was too good to pass up, so here it is. Looking back, it looks like I changed the pattern of the dress somewhat, adding some bands of color. 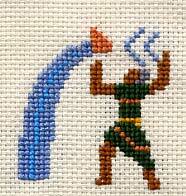 In stitching it, I stopped right in the middle of doing the water jug, as well. Perhaps the implied-but-not-quite-there aspect struck some kind of bizarre asthetic chord. It may look a bit odd, but I like it, and it's a bit different from the pattern, something I always keep an eye out for. In a flurry of ambitious enthusiasm, I tooled around with the other zodiac-themed patterns from the same source. I'm still sort of indecisive about what to do with the mass of patterns though, so I haven't uploaded them here. When I come up with a pleasant arrangement, maybe then I'll post it. Check out the book yourself though, if you're curious, and drop a line if anything intriguing springs from it.